Folding cages on pallets | LL spol. s r. o. Our frame extensions for pallets are made from standard tubes. Standard finishing is in green colour (but it can still be changed on demand). 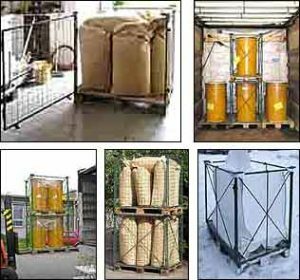 The frame extensions for EUR pallets are used for transport, manipulation and storage of goods. Advantages: the frames are foldable. Trucks can be loaded twice as much – with 66 pallets instead of 33 in the loading area. Storage space is also saved.